The requirement for additional space and the need to replace older, less efficient buildings led the Applied Physics Laboratory (APL), a division of Johns Hopkins University, to significantly develop its campus. With more than 3,500 employees, the campus currently has more than 1.8 million square feet of offices and laboratories, and will grow to 2.25 million square feet by 2006. The organization is committed to the conservation of energy as well as controlling the energy that is consumed. To that end, insulation is playing a vital role in the energy management of the developing structures. 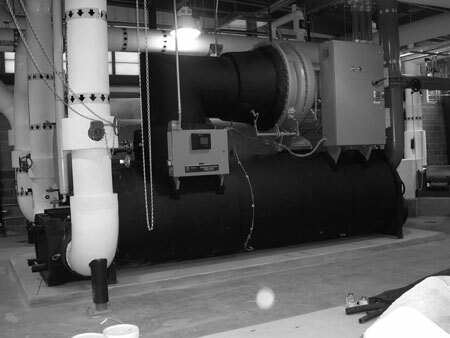 This article specifically focuses on the use of insulation in the campus’ newly constructed Districted Utility Plant (DUP). Keeping pace with the site development and infrastructure requirements, APL has developed a philosophy of constructing Districted Utility Plants for clusters of buildings in lieu of one main centralized plant or individual mechanical rooms in each building. According to Timothy Morris, Capital Facilities Project Manager, "The newly constructed DUP is a centralized utility plant with ice storage that is designed to meet the utility needs of more than 882,000 gross square feet of new and existing office and laboratory spaces." The utilities provided are chilled and hot water, which are used in the buildings’ heating, ventilating and air conditioning systems, as well as emergency power and normal electrical power. The new and existing buildings served by the DUP are connected by direct buried piping systems. Although the 15,000 square foot DUP building is nearly complete, only about half of the mechanical equipment has been installed at this time. The remaining equipment will be installed as the other buildings are closer to completion. When completed, the DUP will have a total cooling capacity of 3,000 tons, three 200-horsepower hot water boilers, total electrical power of 15,000 KVA and three 900-KVA generators for emergency power. APL’s commitment to conserving energy and controlling the energy consumed can be seen in its building specification documents. High-efficiency motors, mechanical equipment and the use of insulation are specified and installed in all new building and renovation projects. As previously mentioned, the DUP uses ice storage technology to create a level demand for power. This favorable load profile allows APL to negotiate a better electric rate since the deregulation of electrical power. "However," said Morris, "All of these efforts would be to no avail if the investment were not protected with insulation." Insulation retards the heat loss or gain from the facility’s piping, ductwork, vessels, mechanical equipment and the building structure. Reducing heat loss or gain conserves energy, reduces temperature fluctuations and enhances the performance of mechanical equipment. Additionally, if heat losses and gains are not minimized, the size and capacity of the DUP would have to be increased to accommodate these losses. "For example," explained Morris, "The increased heat gain in the chilled water piping results in cooling capacity loss and a decrease in chiller efficiency. The chiller efficiency is decreased as a result of lowering the chilled water temperature to meet the demand." The decrease in chiller efficiency in the DUP would equal to a 30 KW increase in the electrical demand and usage charge for this utility plant. Other benefits of insulation include better control of condensation and corrosion on piping systems. Condensation dripping from piping that is not properly insulated causes unsightly stains on ceiling tiles and the possibility of mold growth, a condition to be avoided. Understanding the many benefits of insulation, Morris said that APL uses the most recent ASHRAE 90.1 ‘Energy Standard for Buildings Except Low-Rise Residential Building’ as the guideline for applying insulation to mechanical systems. 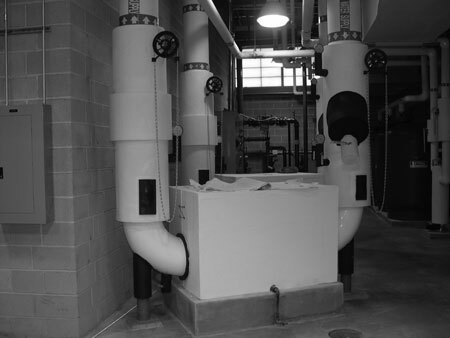 All heating and cooling water piping, chilled water expansion tanks, chillers, heat exchangers and duct work were insulated to meet the guideline. Examples of some of the insulation used are: heat exchangers that are insulated with 2-1/2 inch Armstrong AP Armaflex sheet and enclosed in galvanized steel (see page 24), chillers and expansion tanks that are insulated with 1-1/2 inch thick Armstrong AP Armaflex sheet (at left), and pumps that are enclosed with 2 inch thick removable Knauf board (at left). Piping is insulated with jacketed Knauf pipe insulation in different thicknesses, depending on temperature and pipe size. The cost to insulate all of the mechanical equipment is approximately 1.5 percent of the total building cost. The savings realized on the efficiency of the chillers alone equates to a three-year simple payback as opposed to not insulating the mechanical equipment. Added Morris, "This does not account for the energy savings in other systems, such as heating water, which would further decrease the payback time." During the calendar year 2003, APL electrical and natural gas costs were over four million dollars’ representing approximately 30 percent of the facilities’ maintenance and operating costs. "Because energy costs are one of APL’s larger overhead costs, investments in energy savings with relative short payback, such as investments in insulation, are prudent," said Morris. "The savings will continue long after the initial investment has been recovered." 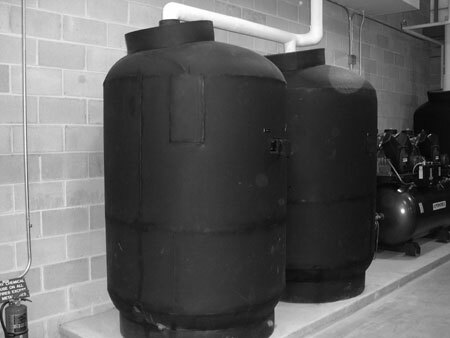 Expansion tanks insulated with 1 1/2-inch-thick Armstrong AP Armaflex sheet. Chillers insulated 1 1/2-inch-thick Armstrong AP Armaflex sheet. Pumps enclosed with 2-inch-thick removeable Knauf board.